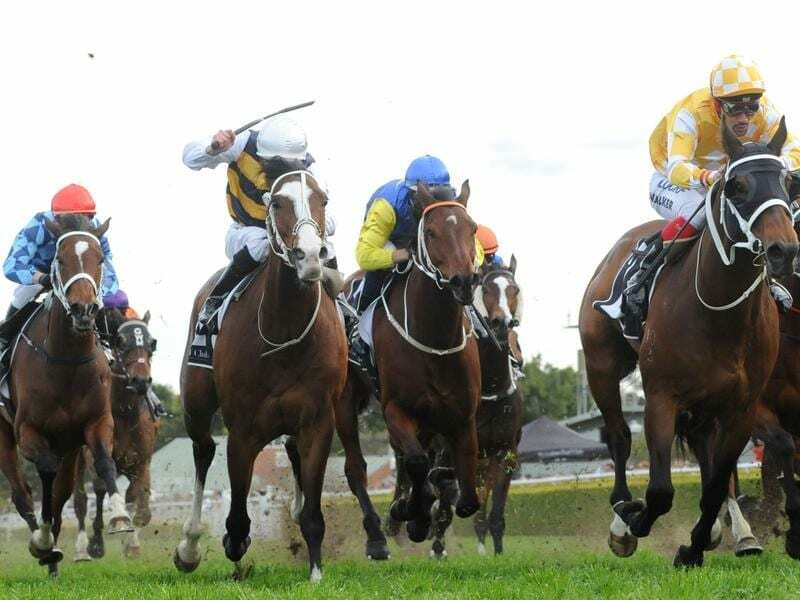 Tom Melbourne (2nd from left) is set to kick off his campaign in the Carrington Stakes at Randwick. While it is most unlikely either Winx or The Autumn Sun will contest the All-Star Mile in Melbourne, their Chris Waller-trained stablemate Tom Melbourne is ready to begin his campaign towards the $5 million race. An equine cult figure, Tom Melbourne is one of 12 entries taken for the Listed Carrington Stakes (1400m) at Randwick on Saturday headed by the Waller-trained Endless Drama. Tom Melbourne has won five races but the most recent was almost three years ago when he took out the Albury Cup for trainers Lee and Anthony Freedman. Since being with Waller, the gelding has run some great races in top company including Group One seconds to Happy Clapper in the 2017 Epsom Handicap and stablemate Shillelagh in the Kennedy Mile the same spring. “He will start off in the Carrington,” Waller said. “He hasn’t had a trial but he has had a jump-out at Flemington with Damien Oliver aboard. “He may not have won the jump-out but he was certainly in front shortly after the post. The $5 million All-Star Mile is at Flemington on March 16 with 10 of the 14-horse field to be determined by popular vote. Waller said Tom Melbourne had pulled up well from the jump-out and still had residual fitness from the spring when his best performance was his first-up second to stablemate Comin’ Through in the Group Two Tramway Stakes (1400m). Three-year-old Aylmerton has also been entered for the Carrington by Goulburn trainer Jean Dubois after an unsuccessful three-start campaign for Lindsay Park. Coolmore bought a half share in the colt after he won the Todman Stakes last year before being unplaced in the Golden Slipper. Endless Drama, who ran third in the 2018 Carrington won by Lanciato, showed his fitness by winning a barrier trial last week in which Winx ran seventh. Waller has also entered Religify and Tangled. There are 22 entries for the two-year-old handicap headed by the Gai Waterhouse and Adrian Bott-trained Espaaniyah, winner of the Inglis Banner at Moonee Valley in October and the topweight with 58kg.